I would finish a packet of this so fast and then hunger for more. But there really is no other way to enjoy this than to make your own because we all know that commercial varieties are deep fried in the same oil over and over again. Ick! I made this and it was oh! so delicious. It was sweet and spicy clinging to crunchy. I was on high. The cassava root may appear quite intimidating because it looks very much like the trunk of a small tree with a very rough, dark and thick bark. It looks hard and heavy too. But once you get the skin off (which is actually not difficult to do) you'll find the inside flesh a smooth, silky, pristine white albeit very firm. I'm always amazed at the contrast. 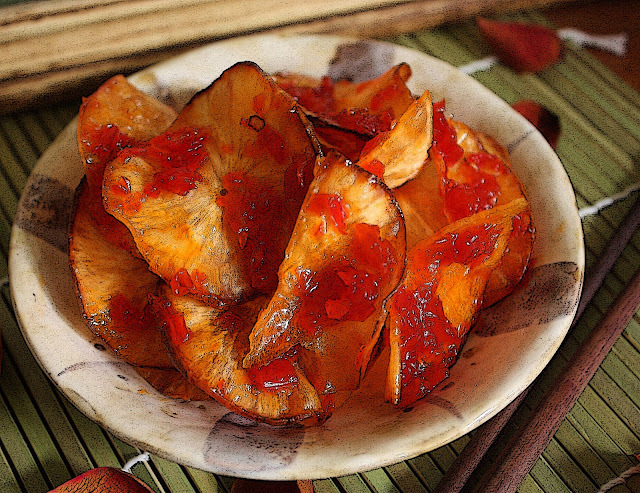 These are sliced thinly and deep fried...very much like potato crisps ~ but they're not as fragile. Potato crisps almost break and dissolve the moment you put them into your mouth, without any effort at all, but these are more crunchy as opposed to crispy and slightly chewy. Lets just say you need to oil your jaw hinge a little. But they are so worth it. Trust me. I made a brilliant, scarlet chillie jam which looked so glaze-y and tempting it should be declared illegal. It's sweet, sticky, spicy, thick and jammy. I doubt it can get any better than that. Trust me on that too. I coated the crisps with it. I believe I almost created nirvana then. To me at least. Skin the root, give it a quick rinse, pat dry and slice very thinly. I used a knife and it wasn't hard to slice at all. Deep fry in a wok or pot of oil. Don't over crowd that wok. Fry until a light golden brown, drain and keep aside. Crush the chillies in a small food processor until medium fine. Put all ingredients in a small pot and cook over a medium flame until it comes to a boil and then lower the flame and reduce until it becomes a thick jam. It should look just like jam. It doesn't take very long. Just watch and stir every now and then. 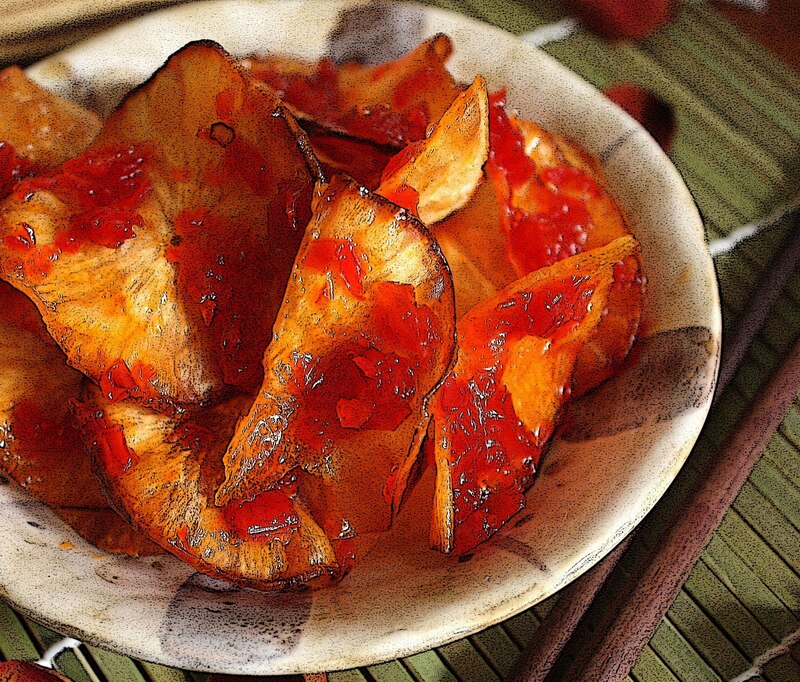 Place the crisps in a large bowl, dollop the jam on top of it and using a salad spoon and fork turn the cassava crisps over itself until they are well coated with the chillie jam. Store in an airtight container. Serve as a starter or snack. OH. MY. YUM!